The Little Dragons program was designed for children ages 4-6 years old! We at Jay King’s Okinawan Karate Dojo understand that keeping your children consistently active and engaged can be a challenge. Martial arts classes are structured to be an excellent outlet for kids to stay active and develop the ability to succeed in the real-world. 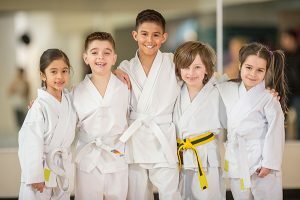 Our curriculum focuses on skills that go beyond martial arts and the dojo to improve your child’s experience at school, home, and many social settings. The Little Dragons program is designed for children ages 4-6 years old. Conveniently located in Madison Heights, VA, our Little Dragon’s martial arts program is all inclusive—Nobody sits on the bench. When kids join martial arts, they enjoy the many mental, emotional, social and physical benefits of this program. Request more information to get your child started today!